Not much hobbying this month. However, leaving for the LVO on Wednesday, and I had two figures that weren't quite finished. 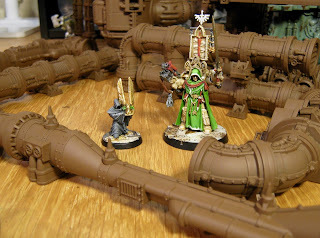 Belial (in the wretched failcast resin) and Azrael's relic bearer. I've also been working on some more of the great 40K terrain sets...but only have them assembled and primed at this point. More later.